Sometimes when you're in the city, you need a warm hug to carry the worries of the world away. And if a hug doesn't always do the trick, catching up with a friend in a cosy little cafe that serves simple and honest food certainly does. It came out warm, although not as hot as I would have liked, and was quite a sizeable dish. 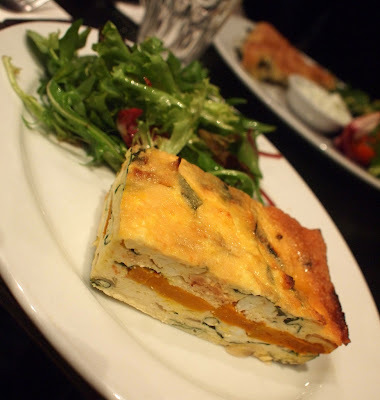 It's rare to find an interesting looking frittata, but I appreciate the effort they made here - look at the seam of pumpkin all the way along. I was a little disappointed in the taste and felt that there could have been a stronger hit of flavour (maybe a stronger cheese thrown into the mix would have helped) but overall it was quite a well rounded dish. 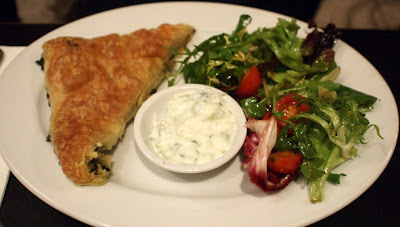 My friend obviously had similar thoughts to me, and while she considered the sandwiches and baguettes, she settled on the spinach and cheese pie made with fetta and ricotta. I wonder how much spinach and cheese they go through here? Quite a lot I'd imagine. In any case, the slight saltiness of the fillo pasty meant this pie was a notch ahead of the frittata. While the lunch dishes aren't perfect at Caffe e Torta, they're still good quality and satisfying. The service is efficient even though the place was packed elbow to elbow, and the prices are reasonable. I'm tempted to return to this bustling little cafe for breakfast, or perhaps for a coffee and a big slice of cake. Indeed, the cafe itself is telling me to.